Six rounded flaps fold inward to create a hexagon shaped envelope with a fun embossed dotted edge. Cut/emboss in the Grand Calibur machine for fold lines and perfect folding every time. 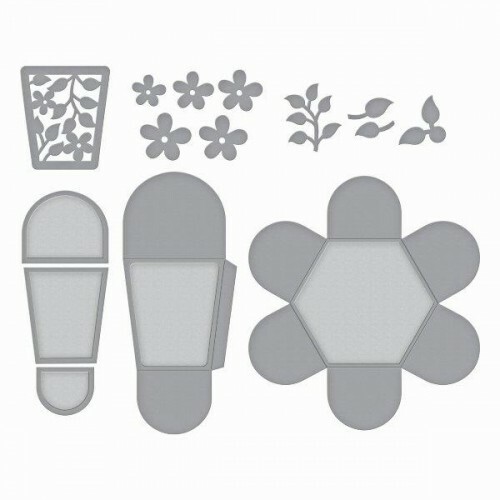 Use the eight flower die templates included in the set to embellish the envelope, or select your own from your die template inventory, the options are endless. Fanciful folds, decorative lids and beautifully detailed embellishments and embossing. Grand Templates box line from Spellbinders. Customise for multiple occasions. Perfect for small gifts, candy and fun surprises. Designed for use in the Grand Calibur Die Cutting Machine. 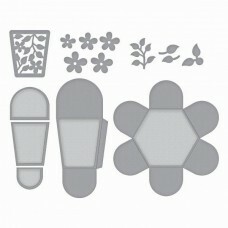 Spellbinders Shapeabilities, cut, emboss and stencil with a single die template.